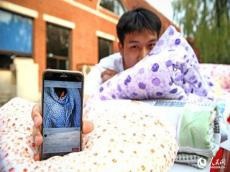 Chinese student Long Yi recently made a small fortune selling quilts used by female students to their male admirers on campus. The idea sounds creepy, but Long said that he was inspired by a female graduate who sold her own quilt within minutes of posting it online. He quickly did the math and realised that the market was potentially worth thousands of yuan. So he spent his savings on dozens of old quilts belonging to female students who are graduating this year from Qinghua University, where Long is a junior. Next, Long posted all the quilts online, and managed to sell a major chunk of them in just one day, raking in a whopping 10,000 yuan (US $1,600). In fact, the demand is so high that he has set up a live stall on campus to complement his online sales. Believe it or not, lovestruck young men are lining up for the chance to cuddle with quilts that once belonged to the women of their dreams. Interestingly, a female exchange student from Korea, named Li, claimed that she sold not just her quilt, but almost all her belongings to Long. It looks like he has other ideas up his sleeve once all the quilts are gone! Is it a little creepy? Sure, but we’ve seen stranger things being sold in China. Remember canned fresh air andtattooed goldfish?